A week or two ago I asked K what she’d like to be for her friend Alexa’s upcoming princess party. She said “a turtle”. I said “That’s not a prince or a princess”. Her next request? “A karate guy.” Nope, K, that’s not part of the assigned category. Please select a prince or princess. Expressing no desire at all for an Aurora costume, she chose Prince Phillip. And agreed that in order to receive said costume she’d stay in her own bed alllll night for four nights in a row. It’s a negotiation. We each have the capacity to provide something that the other wants, right? We used basic knit pants we had on hand. 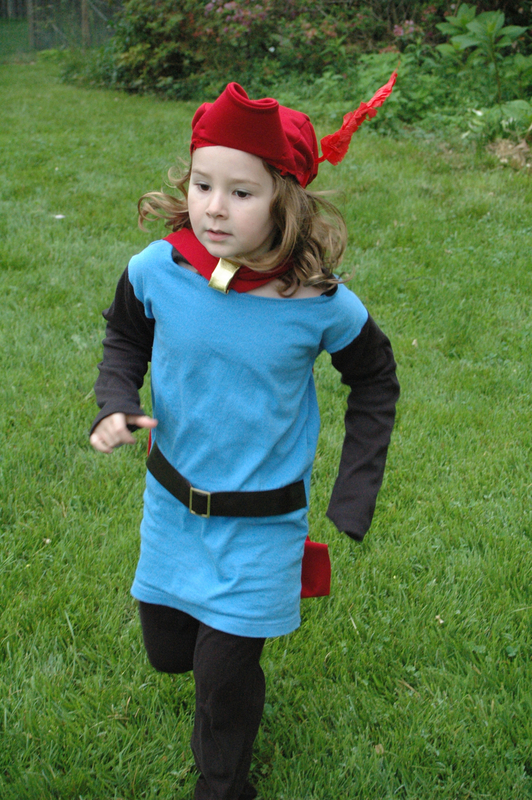 The tunic was built around a thrifted blue adult tee and I added sleeves, a stand-up collar (using craft foam), a belt and belt buckle. As we’ve seen in all of the other princesswear on crafterhours, because there’s nothing scratchy or itchy involved, she’s as comfy as if she were wearing pajamas. And it can in fact become pajamas. 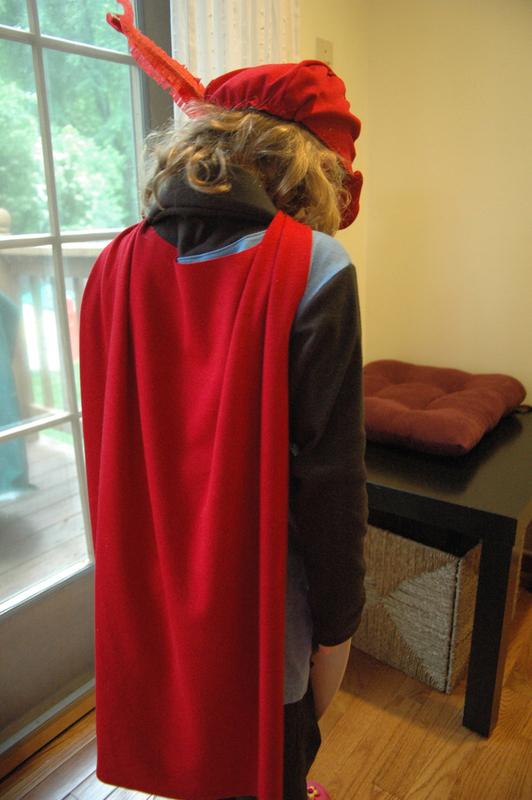 The cape is a heavier poly blend knit that didn’t require finishing. I sewed snaps in at the neck and tacked on a band of stretchy gold lame to cover the closure. To make the hat I traced the parts of a ballcap. I made the brim a bit wider, filled it with a piece of craft foam, folded it in on the sides and then rolled and tacked those sides together once I could put it on her head to adjust. 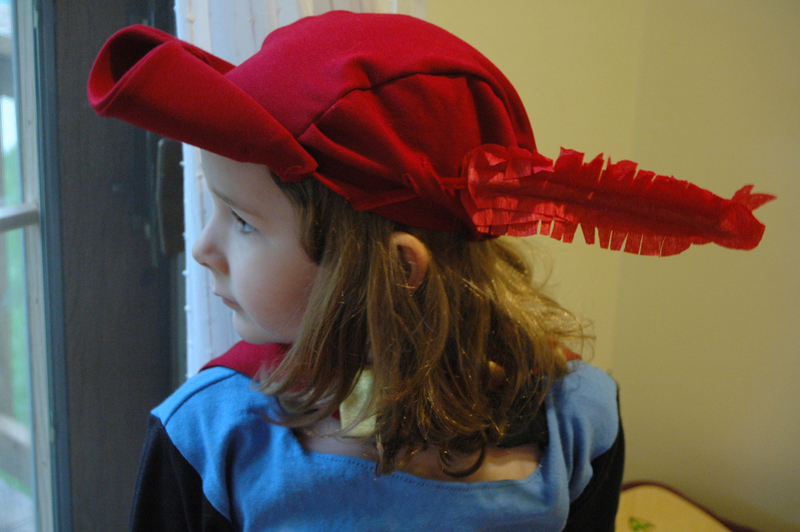 I added buttonholes to one side of the hat to accommodate the long red feather that K insisted was critical. It’s made from a red pipe cleaner and red crepe streamer that I stitched together and then cut a fringe into. 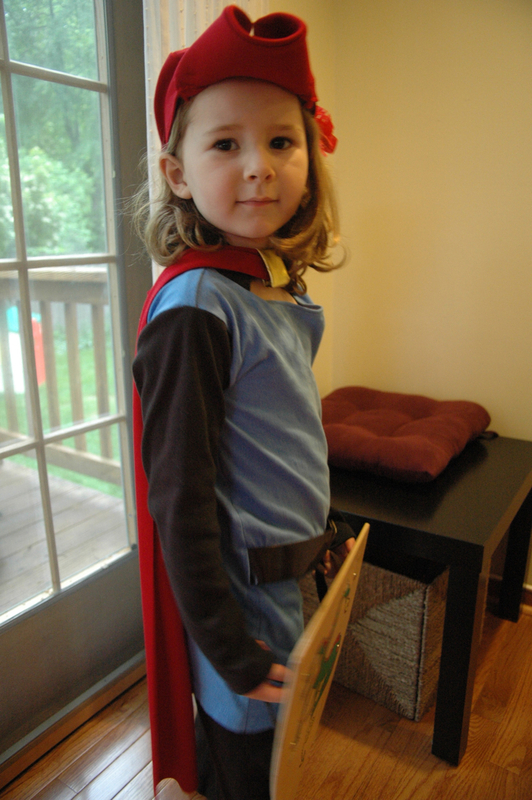 I feel like I can’t fail to admit that it was a little strange to make a “boy” costume for my little girl. Obviously, I got over it. I know, rationally, it’s all part of her finding what she likes in life. And if she was all-princess, all the time, that might feel strange to me too. Any hesitation I felt about it disappeared when I saw her face as she saw the finished product. During the party there was a search and rescue mission that she totally rocked, as you can tell. Since making this costume, there’s been discussion of making Prince Eric and/or Sebastian the crab. There’s also been discussion of acquiring a horse for Prince Phillip to ride. More negotiations to come. Unrelatedly, but another thing I can’t fail to mention…. Skirt Week sponsors will be announced tomorrow! 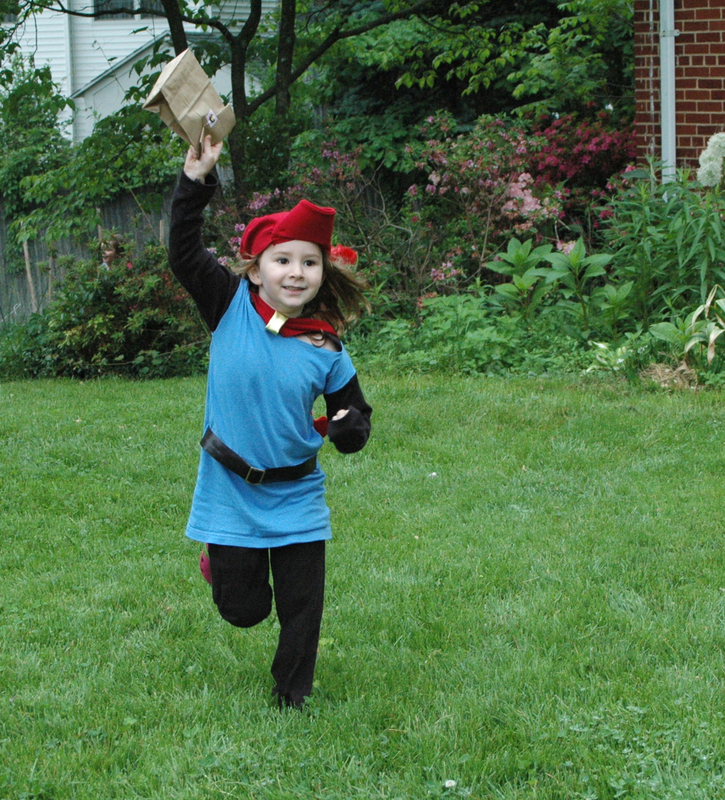 You made the costume girlie enough, and yet tomboy-ish enough my inner child is jealous. At least 50 cool mom points earned! 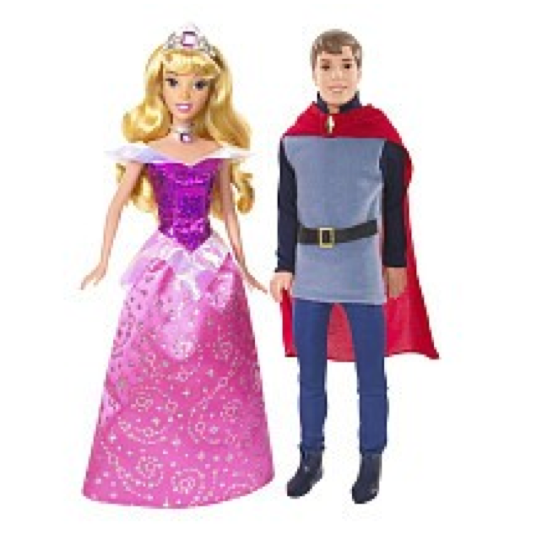 haha, I expected the other Prince Philip too and was very curious to see how that looked :D But she looked very cute in her outfit and I love the look on her face wearing it. Nice! Adorable. I especially love the hat. And the fact that there were negotiations involved. I assume they worked? My daughter would have gone as the frog version of Tiana. I, like you, don’t really care what she wants to be. I appreciate the imagination involved. I love the hat, you did an awesome job. I never know what mine is going to come up with. We are stuck squarely in a pink stage now, so I would be thrilled with a prince!